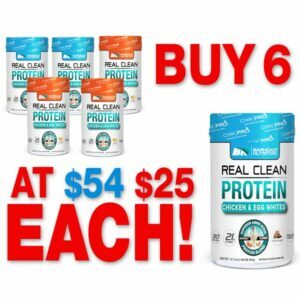 CASE SPECIAL – Buy 5 Jugs, Get 1 Free SAVE $29.95! BarnDad’s FiberDX® GERMAN CHOCOLATE SHAKE takes your daily fiber routine to the next level! BFDX’s GERMAN CHOCOLATE SHAKE packs 56% of your daily fiber needs to help reduce insulin spikes, curb hunger and support visceral fat loss. 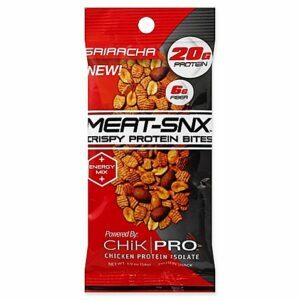 It also contains an AMPED protein blend to help speed and improve lean muscle recovery. With BFDX’s GERMAN CHOCOLATE SHAKE, you’ll get all the same incredible health benefits of our original proprietary fiber matrix PLUS the irresistible delight of a smooth and creamy chocolate shake. No bloating or negative side effects. We are not claiming BFDX® GERMAN CHOCOLATE SHAKE is a “cure-all,” BUT if you want to lose weight without sacrificing all the foods you love and are looking for a simpler and more effective way to lose weight, maintain lean muscle and help to control your blood sugar, then BFDX® GERMAN CHOCOLATE fiber shake is just what you’ve been looking for! And it works for everyone to some degree! Click here for more information on soluble and insoluble fiber. 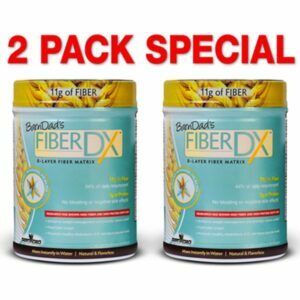 BarnDad’s FiberDX® is a proprietary blend of soluble and insoluble fibers that naturally reduces hunger and supports healthy weight management, lean muscle and a healthy digestive system. Originally developed in Germany, where it was used by diabetic and obese patients, BFDX reduces hunger, insulin spikes and slows the digestion and absorption of sugars and carbohydrates, allowing glucose to be metabolized more effectively. BarnDad’s FiberDX® also supports heart health. It’s long been clinically proven that a diet high in fiber helps reduce cholesterol and triglycerides, which has a positive impact on the body’s mechanisms for regulating healthy cholesterol production. More recently, fiber has been shown to be inversely related to nonfatal myocardial infarction and coronary heart disease death and a reduced the risk of colon cancer. Experts recommend a healthy diet include a minimum of 25 and up to 50 grams of fiber per day. 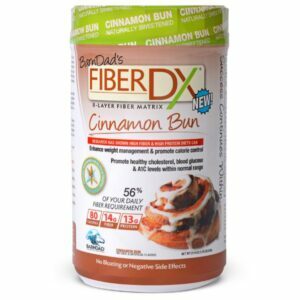 One serving of BarnDad’s FiberDX® provides 11 grams of Fiber, a full 44 % of your daily fiber requirement. 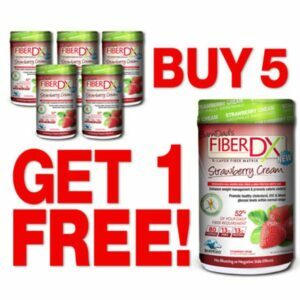 While single fiber products or supplements (imbalanced blends) often cause bloating, BFDX’s proprietary, eight-layer fiber matrix, works in days to provide consumers all the benefits of a high fiber diet without the negative side effects. BarnDad’s FiberDX® is a flavorless, universal ingredient that easily mixes with water or other beverages and can also be used in baking as a flour substitute, resulting in healthy and delicious meals, snacks and desserts. BFDX’s GERMAN CHOCOLATE SHAKE is a decadent and delicious fiber supplement that mixes easily with water or other beverages. 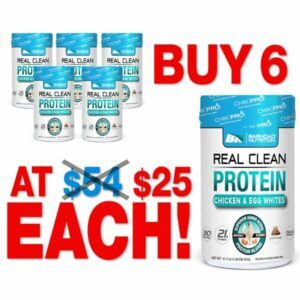 You get all the same incredible health benefits of our original proprietary fiber matrix PLUS the irresistible delight of a smooth and creamy chocolate shake. No bloating or negative side effects. 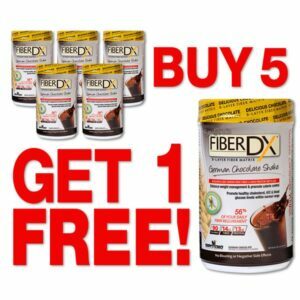 BarnDad’s FiberDX® GERMAN CHOCOLATE SHAKE takes your daily fiber routine to the next level! We’ve boosted our original formula with over 25% more fiber and over 85% more protein per serving! Plus, with BFDX’s GERMAN CHOCOLATE SHAKE, you’ll get all the same incredible health benefits of our original proprietary fiber matrix mixed with the irresistible delight of a smooth and creamy chocolate shake. No bloating or negative side effects. The unique formula helps you feel pleasantly full before you’ve had a chance to eat too much and keeps you from getting hungry between meals. Simply take BFDX® GERMAN CHOCOLATE SHAKE 15 minutes before your regular meals, with water or a healthy beverage of your choice, and begin to look and feel better, while you continue to enjoy your favorite foods! BFDX® GERMAN CHOCOLATE SHAKE is the Ultimate fiber supplement for optimum health, peak performance and vitality at any age. 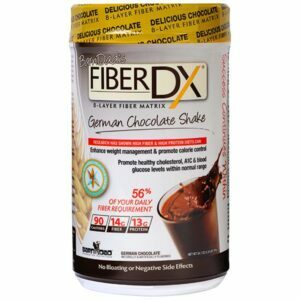 Satisfy your chocolate cravings and your daily fiber needs with BFDX’s GERMAN CHOCOLATE SHAKE. Copyright © 2019 · BarnDad Innovative Nutrition. All Rights Reserved.